Summary: Being a Christian is about accepting Christ's righteousness (via admission that my own righteousness is inadequate), and living in the power of the Holy Spirit (via admission that my own strength is inadequate).A helpful, encouraging short book which applies foundational Christian theology to real life in a very practical way. Bridges takes the doctrines of justification and sanctification (that is, the righteousness of Christ and the power of the Holy Spirit) and attacks the issues of self-righteousness, persistent guilt and self-reliance which most Christians struggle with. 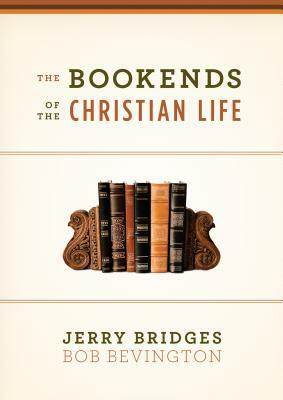 I like that because Jerry Bridges has been thinking and writing about the Christian life for such a long time, he's comfortable explaining things in his own way without using some of the overly familiar expressions & arguments many of the current authors I'm reading tend to rely on. Good lesson on "How to Preach the Gospel to Yourself"1st Bookend: "The Righteousness of Christ"- He paid the penalty we should have paid, by enduring the wrath of God we should have endured, by His perfect obedience. And it required Him to give up HIS relationship with the Father so that WE could have one.- FAITH involves my Renunciation of any trust in my own performance as a basis for acceptance by God and a Reliance entirely on the perfect obedience and sin-bearing death of Christ for my standing before God-Lk 7 the sinful woman, Isa 6 the prophet, Acts 9 the Pharisee -- all had 1) a deep conviction of their sin 2)a deep conviction of their forgiveness which prompted 3)a deep love,gratitude, and surrender leading to action, on their part.Enemies to this Gospel:#1 Self-Righteousness - when we feel our righteousness merits any good standing before God and others; it's anti-Gospel and self-justification. Christ's righteousness met God's requirements of holiness and wrath against sin: "The wrath of God against the sin of saints was completely exhausted on the cross." John Owen#2 Persistent Guilt - comes from depending on our our righteousness for right standing with God and knowing how inadequate this is. Only the life and death of Christ offers a legitimate path to freedom from a guilty conscience.#3 Self-Reliance - on our own power, not the Holy Spirit's. "Apart from Me you can do nothing." Jn 15:5"Let sin break our hearts but not our hope in the gospel." Thomas Wilcox, 17th century PuritanFocal Points:1. I am a desperately lost sinner2. The righteousness of Christ is all-sufficient for me every day3. I want to see and reject my 'functional saviors' (idols) each day2nd Bookend: "The Power of the Holy Spirit"Just as we must look outside ourselves to Christ's righteousness for our standing before God, we must look outside to the power of the Holy Spirit for strength to live the Christian life.Faith: Renounce all confidence in our own power and Rely entirely on the power of the Holy Spirit for His enablement - we cannot fight sin, grow in character, nor minister effectively without it.Work of the Spirit: our guilt, His grace, our gratitudeDependent Responsibility: "For this I toil (labor to the point of exhaustion), struggling (agonizing) with all His energy that He so powerfully works within me (divine enablement).Philippians 2:12–13 (ESV)12Therefore, my beloved, as you have always obeyed, so now, not only as in my presence but much more in my absence, work out your own salvation with fear and trembling, 13for it is God who works in you, both to will and to work for his good pleasure.Means of Grace that the Holy Spirit uses:- daily communion with God- preaching the gospel to ourselves (the primary instrument of transformation)- the Bible- daily circumstancesFour Ways the Holy Spirit Encourages us:1 - gratitude: our gratitude for the grace He purchased gradually overcomes the vise-grip of our self-centeredness, and we 'no longer live for ourselves'.2 - power of new affections (God becomes more satisfying, our all-surpassing greatest Treasure; idols - less)3 - joy in the Relationship; experiencing same kind of love in abiding in Christ, that the Trinity experiences4 - the promises of God, to equip us to fight! and to walk through trials and GLORIFY God in the processFocal Points:1. our desperate weakness2. the reliable power of the Holy Spirit3. rejecting self-relianceReplace self-reliance with humility and godliness.Humility: "honestly assessing ourselves in light of God's holiness and our sinfulness" - C.J. MahaneyGodliness: "the attitude of regarding God in everything we do, all the time. "Preaching the Gospel to ourselves: "Jesus lived the life I should have lived and died the death I should have died." While this book isn't particularly well written or brilliant, it did strike a few deep chords which were particularly helpful to me. I needed some reminders. A superb study of the two Biblical pillars of the Christian life, the righteousness of Christ and the work of the Holy Spirit. Wow. Praise God for men who seek him first and point others in the same direction. God used these authors to encourage my faith and convict my heart. I'm super thankful for the clear presentation and explanation of God's word in these pages. Back before there was a gospel revelation at Cornerstone Bible Church, there were rumblings of the change to come. I read The Disciplines of Grace with my Bible study (then called "Flock") and it began to stir in my heart the beginning of a greater understanding of grace, mercy, and love of God.Since that change in my understanding of the complete work of the gospel began with a Jerry Bridges book, it's only fitting that another should contribute so much to my growing understanding of the magnitude of the gospel.The Bookends of the Christian Life compares the two anchors of saving faith to two bookends that keep the books (i.e. Christian life) from falling over. First of all, it looks at the righteousness of Christ. Jesus lived a perfect life. He never sinned; not even once. And, when He died on the cross, He paid the price that I ought to have paid. Not only did He bear the punishment I deserved, but He also transferred His righteousness to me; when God sees me, He treats me as though I have lived Jesus' perfect life.This is so important for the daily Christian life. When sin enters my heart, when I make mistakes or simply give in to temptation, it's tempting to let guilt paralyze me. I'm afraid that I'll lose what I received from Christ, and I'm tempted either to just give up or scramble desperately to try and make up for it. Bridges cites two enemies to the gospel: self-righteousness and persistent guilt. Self-righteousness thinks of the cross as an eraser, wiping the slate clean so that they can fill it with its own good works. This can have the (often unintended) side-effect of feeling as though God owes us something for our good works. But the truth is that we can't count our righteousness without also counting our sin, putting us right back at square one. But if we count the cross as having paid for ourselves, then we can also count the righteousness of Christ as our own. But instead of breeding the pride and entitlement that self-righteousness does, it breeds humility, gratitude, and joy at what Christ has done.It also kills guilt because the work of Christ is sufficient. We no longer need to bear the weight of our sin because Jesus has already paid it all. Once we believe this, we are freed from the guilt of sin. But we're not free to just do whatever we feel like doing, which is really just enslavement to sin; we're free to obey and love God because we've been empowered to do so.The other bookend is the power of the Holy Spirit. It's because of the power of the Holy Spirit that our lives and our hearts can be changed. And this power is always at our disposal, ready to help. We can have confidence that we will grow and change because it has been promised to us.Bridges cites one more enemy of the gospel: self-reliance. The clean slate strikes again: this time, instead of causing us to feel like we deserve God's favor, it makes us feel as though we need to earn God's favor. But this is an affront to the cross. It presumes that the work of Christ is not enough. But remembering the power of the Holy Spirit reminds us that we don't need to work for our own righteousness any more than we need to work to make up for our sin. It's all been taken care of by the work of Christ already.This is a short, simple work that simply highlights the truths of the gospel in light of the gospel. It was a balm for my soul in trying times. If you ever feel as though it's tough going to follow Christ, turn to these truths and let the gospel comfort, encourage, and strengthen you. This book is a quick, satisfying gospel shot, and if you want to live that reflects the gospel, it's a great place to start. So good. A zillion highlights. Foundational truth for every believer. There are lots of good books on the essence of the Gospel, explaining the centrality of the cross and the importance of imputed righteousness, and there are lots of good books on spiritual growth, explaining the importance of walking in the Spirit and pursuing spiritual disciplines, but there aren't too many books that do both. That's what sets "Bookends" apart.In typical lucid Jerry Bridges style, it is explained that the two bookends are the righteousness of Christ and the power of the Holy Spirit. The entire Christian life is to be lived in between these two anchors. We are 100 percent dependent on both bookends, and yet also 100 percent responsible "for the placement of each of our books on the bookshelf of our lives." (152). This is a tricky balance, a tightrope on which every believer must carefully walk throughout his/her entire spiritual journey on this earth.Making the walk a challenge are various enemies that the authors discuss at some length. Self-righteousness is the enemy of the first bookend, while self-reliance is the enemy of the second (124). Only through the "expulsive power of a new affection" can we make true progress, where love for what is good displaces our nagging love for what is evil. (112-114). This is a key insight and the only reliable hope for long-term victory over sin.My only gripe is that the book tends to be individualistic. Chapter 7 on "dependent responsibility" would have been a good place to discuss the importance of involvement in the local church. On the last page of the book, there is mention of the importance of "selfless serving, radical giving, and sacrificial living," but still no mention of the church? This is the appropriate context in which these things should take place. Certainly our growth in grace will be stunted if we insist on doing it by ourselves.Still, this is a highly useful book, particularly for discipleship situations. A most Excellent book, that lays out a practical view of the Christian life, in a personal sense. I don't want to simplify it as a how-to guide to sanctification, because it went far beyond that! Bridges lays out three enemies of the Gospel-- Self-righteousness, Guilt, and Self-reliance. The Cure for these rests in leaning on the righteousness of Christ and the power of the Holy Spirit, the two bookends that support our lives. We cannot merit salvation, favor, or blessings by our goodness, only by the Righteousness that covers us. We cannot cause ourselves to grow, it is the working of the Holy Spirit in our hearts. Don't worry, our responsibility it well laid out, but the sovereignty of God in our justification and sanctification is clearly explained. The two are woven together masterfully. The book is filled with applicable scriptures and solid teaching, interlaced throughout with hearty encouragement. One I would recommend and read again! Powerful, Succinct & PracticalMy Bible Study teacher recommended this book to a friend of mine who was struggling with sin, guilt and depression. In wanting to be a supportive friend, I read it too, and boy am I glad I did. This is a powerful, succinct and practical manual on how to live a fulfilled and joyful Christian life, useful in service to God, not through our own power and righteousness, but through Christ's alone.Christians of any age and maturity level will find this small book helpful for avoiding the pitfalls of self-righteousness on the one hand and persistent guilt on the other. Phenomenal. This book is for the new believer, the struggling believer, and the established believer. It was so encouraging and met me right where I was. Jerry unpacks what it means to truly live a life transformed by the Gospel of Christ and the freedom and peace that entails. He also discusses at length four enemies of the Gospel that rob us of our joy and rest in Christ. This book fueled and propelled me in my walk with God and is one I will read many more times in my life! An overview of what Jerry Bridges talks about in other works, notably 'Pursuit of Holiness' and 'Discipline of Grace' (both of which I highly recommend). Basically, Christians need to preach the gospel to themselves every day, having two bookends as their anchor: the righteousness of Christ and the power of the Holy Spirit. A down-to-earth, accessibly written work for even the newest of believers, it challenges readers to really lean all of the "books" of their lives between those two truths. This is a book best read as an annual reminder to order my faith-perspective according to some over all principles that have guided believers through the centuries, as the Psalmist asks in the 121st: from whence comes righteousness and the strength to be so? A very simple word picture - bookends that hold up and stabilize this life lived as a follower of Jesus Christ. Bookend #1 is the righteousness of Christ. Bookend #2 is the power of the Holy Spirit. This is a book well worth reading! This is an amazing book. I highly recommend it! It specifically talks about the righteousness of Christ & the power of the Holy Spirit (the two bookends).I found this book very helpful and I think you will too. I'm a little ambivalent about this book. Some parts of it were quite good and helpful whereas other parts didn't resonate at all. I think I found the first half more informative and useful than the second half. Perhaps I was losing interest as I read? I think there is definitely room for clarification and expansion. Seems to reduce everything down to "the gospel." I hope to have a better review once I've gathered my thoughts. Book was ok, interesting and insightful, not really what I was looking for to read. Small group discussion has been the best of this study. This book has helped me understand the Gospel better than any other. I love this book. It's an extended meditation in the vital truths that nurture Christian faith and fuel Christian living. Wish I could hand out boxes and boxes of them. Simple goodness. Jerry Bridges Bob Bevington - JERRY BRIDGES was an author and conference speaker. His most popular book, The Pursuit of Holiness, has sold over one million copies. Jerry was been on the staff of The Navigators for over fifty years, and currently served in the Collegiate Mission where he was involved primarily in staff development, but also served as a speaker resource to the campus ministries.